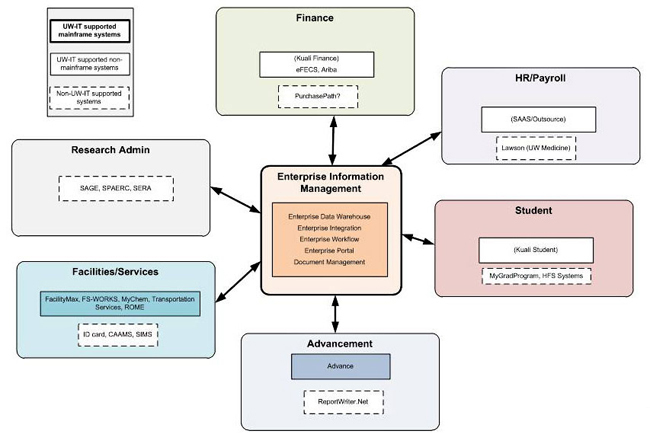 Enterprise Information Management (EIM) provides consistent and reliable architectures, guidelines, standards, tools, and services for the analysis, design, management, delivery, and integration of institutional data. 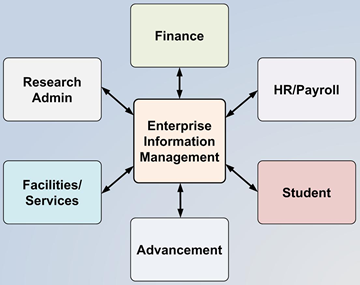 EIM is a key component to realizing the overall administrative systems strategy by rationalizing and improving upon our valuable data assets of the University. Information flows out of source systems into the Enterprise Data Warehouse (EDW) for powerful cross-domain analytics. The EDW will be the single source of truth for University information. It will include well-documented data definitions, reducing misinterpretation and providing powerful analytical capabilities for decision-making. 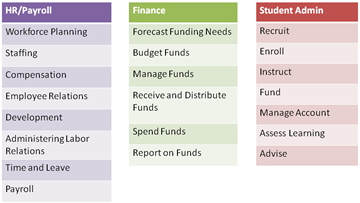 Directly support several strategic University initiatives, including Activity Based Budgeting and the Provost Program Evaluation metrics. 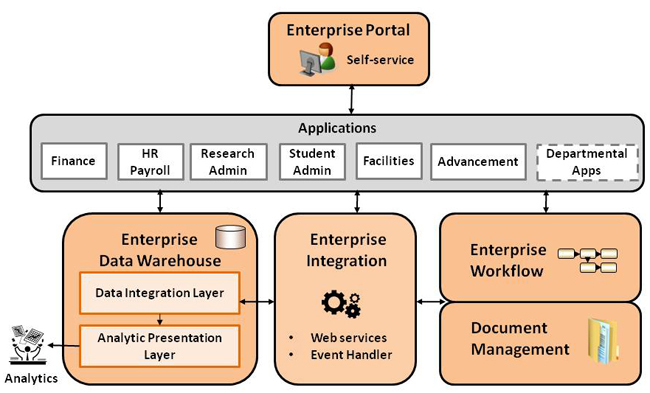 Enterprise Data Integration takes advantage of metadata, consistent data definitions and security rules to securely and reliably provide access to information across functional domains. Includes a new “event handler” capability that will push relevant data to applications when a specific business event occurs. Enterprise Workflow enables business process automation via electronic routing and approval of documents across multiple organizations. Completed two successful pilots in 2011. Future projects include automating bulk JV submission. 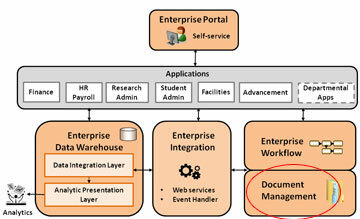 Document Management provides a central repository of digital business documents that include mechanisms for imaging, storing, searching and collaboration. Work is now underway to define enterprise document management requirements and choose a vendor for enterprise pilot projects. The Enterprise Portal serves as a single Web site that highlights information relevant to the individual, and serves as a starting point for engaging and conducting “business” with the University, as a student, faculty member, staff member, researcher, or clinician. The UW Data Map is a data and business process classification scheme developed by the Data Management Committee to provide consistency in cataloging and maintaining institutional data.The map shows the progress of the Enterprise Data Warehouse build-out by subject area, with the relative percentage complete in each area. 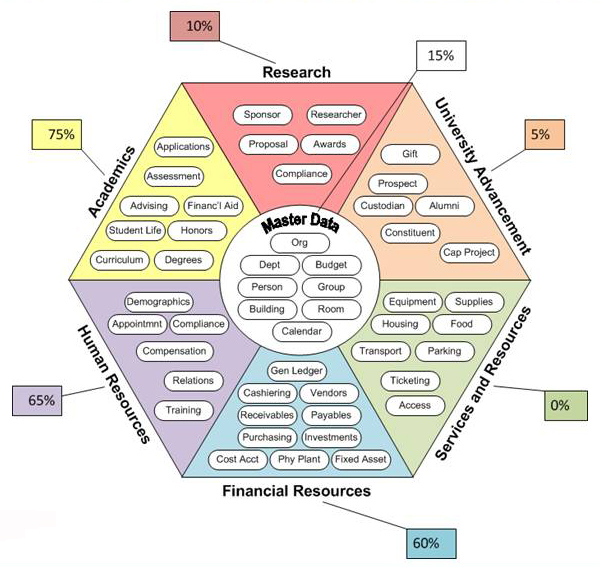 Master Data represents key data points that span across subject areas and are used to help cross-domain analysis.More information on the Data Management Committee. 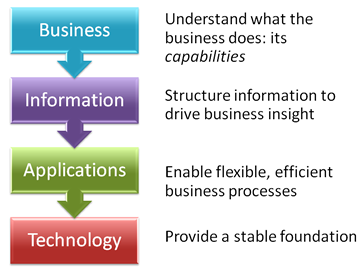 The Business Architecture layer clarifies what the business does, expressed as its “capabilities” (for example, paying employees, procuring goods and services and enrolling students). The Information Architecture layer defines the information required to achieve the capabilities. The Applications Architecture layer defines flexible and efficient mechanisms to deliver business processes that enable the capabilities. 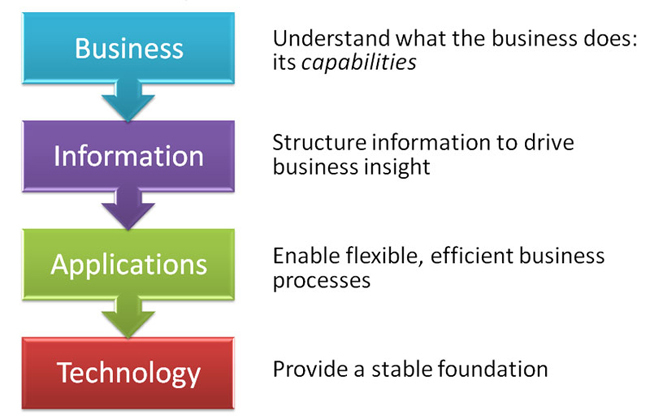 The Technology Architecture layer identifies the technical foundation needed to provide stable and secure services. 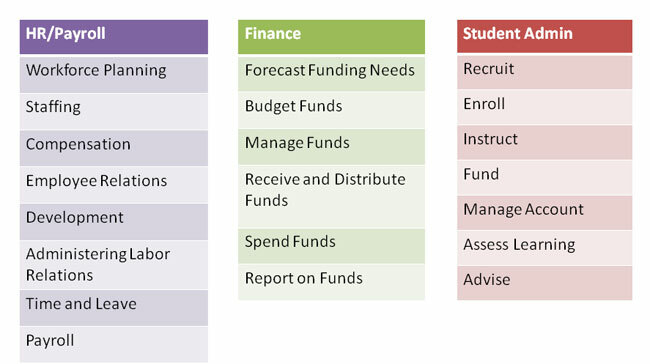 This business capability map shows what the business does (e.g., paying employees, procuring goods and services and enrolling students). 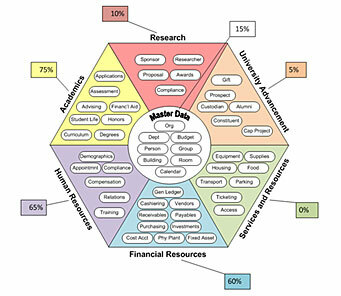 The map helps identify major requirements and gaps in the UW’s current systems, as well as overlaps and dependencies. It is used to drive any new functionality, ensuring solutions meet business needs. 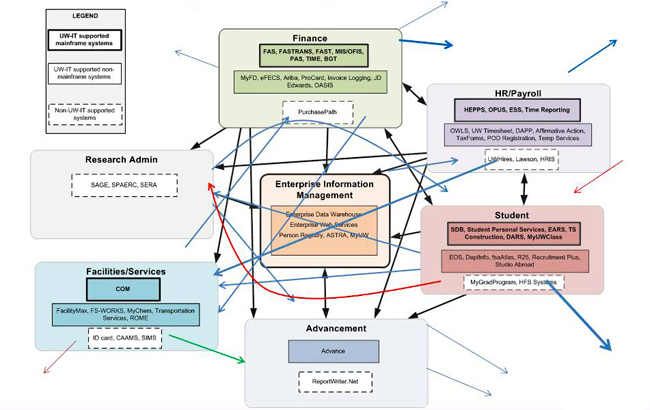 This diagram shows the current state of the University’s centrally supported core administrative systems. The UW has a diverse portfolio of applications operating on a variety of hardware platforms, implemented over the last forty years. 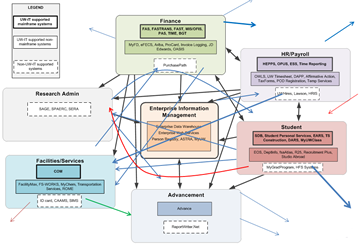 This diagram doesn’t include the hundreds of “shadow” systems developed at the unit level to meet information and business process needs not satisfied by the central systems or needed to support local requirements.The arrows represent the hundreds of point-to-point interactions between systems that have evolved over numerous years to meet the UW’s changing business needs and to make up for gaps in legacy functionality.The complex legacy of interdependencies makes it challenging to change one application without impacting the others, or to pull out and replace an application. It also complicates business continuity planning. Furthermore, as information flows from system to system without agreed-upon data definitions, it creates a “data telephone” effect where critical information is misunderstood and misinterpreted.